No need for lugging around quarters anymore. We are the largest card operated Laundromat in St. Petersburg! 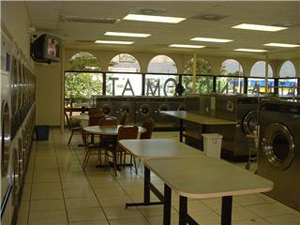 We specifically designed our Laundromat to be state of the art. All of our machines are computer operated and use a plastic card to activate both washers and dryers. We have a one time charge to activate your card, then, you choose how much money you need to do your laundry. No more lost money on quarter machines that don't work! No more lost time on machines that don't work! We are fully staffed every day with Friendly Professional Laundry Personnel to assist you and we guarantee to be the cleanest Laundromat you will ever experience. We have plenty of seating, Color T.V. 's and free internet service. Our folding areas are the largest in the area! We provide the largest selection and sizes of machines in the City of St. Petersburg, St. Pete Beach and surrounding areas. We are open 7:00 am - 9:30 pm - 7 days a week. We have the largest selection of front load washing machines. 12 double front load washers! We have large stack dryers providing up to 40 HOT drying bins. We offer the largest dryers in town with our 2 huge 75 pound single dryers. Perfect for your comforters and rugs!! 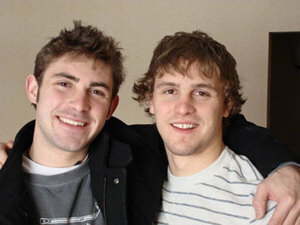 “Andrew and Alex are college students and like the free WiFi and the attendant on duty. We are guaranteed the machines work 100% of the time and we can get online!" 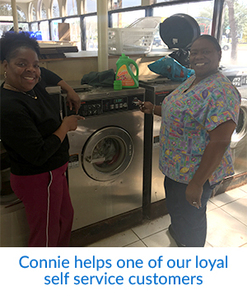 I have been doing my own laundry at Central Laundry for the past 5 years and appreciate the professional staff, cleanliness of the premise, safety, and, most of all, the quarantee that every washer and dryer will work every time. I have never lost money due to a machine not working.